In Photos, there are two ways to create slideshows. You can quickly play a slideshow of the photos in a moment, complete with a theme and music. If you want to have more control over the options in your slideshow, you can create and save a slideshow project. You select a group of photos, then add text, choose a theme, add music, and set how long each slide appears. 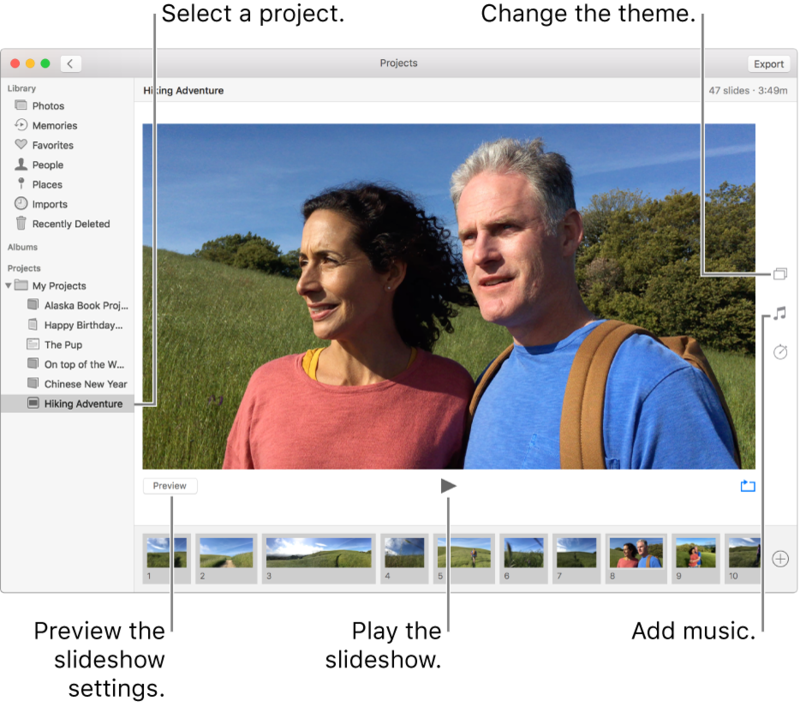 You can include video clips in a slideshow, and export the slideshow to play on a Mac, iOS device, or Apple TV. You can quickly play a slideshow of the photos in a moment. You can select a theme and music for the slideshow, but you can’t customize the slideshow further. In the Photos app on your Mac, click Photos in the sidebar, then click Moments in the toolbar. Select some photos in a moment, then choose File > Play Slideshow. Click Themes, then select a theme. A preview of the theme appears in the pane. Click Music and select the song you want. To turn off music, click the song again to deselect it. To stop playing the slideshow, press the Escape key. You can also press the arrow keys to skip forward or back through the slides and press the Space bar to pause the slideshow. In the Photos app on your Mac, select the photos you want in your slideshow. You can add or remove photos later (see “Add or remove photos and text in a slideshow,” below). Choose File > Create > Slideshow > Photos. Click the Slideshow pop-up menu and choose New Slideshow. Type a slideshow name in the Slideshow Name field, then click OK.
To reorder photos, drag photos into the order you want them in the bottom of the window. To select a theme, click the Themes button , then click a theme. You can change the theme at any time. The theme you choose determines text position, fonts, and the transitions that appear between slides. The pan and zoom effect, also known as the Ken Burns effect, is available only for the Ken Burns theme. To select music for the slideshow, click the Music button , click the down arrow next to Music Library, then select a song or songs. Choose Theme Songs from the pop-up menu to see music included with Photos, or choose iTunes to see music from your iTunes library. Drag the songs you selected to change the order they play in. To delete a song, select it and press Delete. Note: If you don’t see your iTunes music listed, close Photos, then open iTunes and sign in if you haven’t already. With iTunes open, open Photos again, then select your slideshow. Click the Music button and choose iTunes from the pop-up menu to see your music list appear. Set the slideshow to match the length of the selected music: Select Fit to Music. Set a specific display time for the slideshow: Select Custom, then drag the slider to specify how long the slideshow should play. Set a transition for the entire slideshow: Select the Transition checkbox, then choose a transition type from the pop-up menu. Set slides to fit the screen: Select the “Scale photos to fit screen” checkbox. To see a preview of the slideshow, click the Preview button. Click Preview again to stop the preview. You can also set the slideshow to loop continuously by clicking the Loop button . To play the slideshow, click the Play button . To stop playing a slideshow, press the Escape key. You can also press the arrow keys to skip forward or back through the slides, and press the Space bar to pause the slideshow. For information about sharing a slideshow, see Export photos, videos, and slideshows. After you create a slideshow, you can add or delete photos at any time. You can also add text to selected slides. The text position and font is determined by the theme you chose. When you add a Live Photo to a slideshow, it appears as a still image. In the Photos app on your Mac, click a slideshow under Projects in the sidebar. Add more photos to a slideshow: Select a photo in the row of thumbnails at the bottom, click , then click Add Photos. Select the photos you want to add, then click Add. Add text to a slide: Select a photo, click , then click Add Text. Select the text in the text box, then type the text you want. Delete text from a photo: Select the text in the photo or select the T frame before the photo in the row of thumbnails, then press Delete. Delete a photo from the slideshow: Select the photo you want to delete, then press Delete.